"When I Was a Boy" is the leadoff single from Electric Light Orchestra's new record, Alone in the Universe. 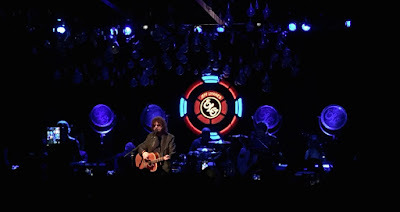 The crescendoing ballad finds Jeff Lynne reminiscing about his time in Shard End as a child, listening to the radio and dreaming of a life in music. We all know how that turned out. When I was a boy, I never thought I'd be able to see ELO live. Due to their breakup in the '80s, I deemed it impossible in a similar way that I'd never see Peter Tosh or Hendrix in concert, even though Lynne was still alive. Fortunately for me and those lucky enough to procure tickets, I had my dream come true on Friday night at Irving Plaza. When we arrived at Irving Place, the line was the longest I'd ever seen it, hugging the wall around the corner and halfway down 16th St. Then again, I assumed most of the ticket holders were old enough to be retired and probably weren't coming straight from work. As it turned out, some had come from much further locales, as I overheard a couple claim they had travelled all the way from Vancouver. Eventually we slithered into the venue, grabbed beers for the wait, and found a spot on the packed floor to the right of the soundboard. A baker's dozen of musicians (counting Lynne) took the stage to roaring applause. They wasted no time at all, bursting into a joyous "All Over the World" from the Xanadu soundtrack, which I'm not too familiar with because I regrettably sold my father's LP when I was in high school. I was definitely familiar with the next entry, "Evil Woman," which featured Jeff headbutting a smiley face balloon that had wafted into his sightline. Not only did Lynne still possess his familiar mane of curly brown hair, his instantly recognizable voice was somehow miraculously untouched by time, whether slinking along the stanzas of "Showdown" or floating freely out of the falsetto refrain of "Strange Magic." I found myself laughing hysterically into my date's ear as they delved into each essential song. I was obviously not the sole smiler in the house, but even the bandmembers found themselves unable to suppress their grins, the string players beaming as they plucked out "Livin' Thing." While most patrons weren't acquainted with the new numbers yet, thankfully they didn't dare talk over them. "When the Night Comes" was actually superior to its recorded version, Jeff's vocals cutting cleanly compared to their processed predecessors. At its end, Jeff announced, "Here's another one off the new album. Sorry about that." The crowd chuckled. "It's good though," he offered, serving up the uptempo "Ain't It a Drag." It was a little bit of a drag that he felt he had to apologize for the fresh tunes, especially when the band kept banging out hit after hit, including their biggest one ever, "Don't Bring Me Down." My favorite performance of the night was "Sweet Talkin' Woman," with all parties on point, and Lynne crushing every "No, no, no!" "Telephone Line" was a close runner-up, the crowd happily howling every "Oh!" in the chorus. The band closed the set with fan-favorite "Mr. Blue Sky," veteran ELO member Richard Tandy tying things up with his vocoder solo. Jeff thanked the crowd and exited the stage, leaving his twelve mates behind, foretelling an imminent encore. After all, it would've taken awhile for everyone to file into the wings. Lynne wasn't long, returning for a rollicking "Roll Over Beethoven" before taking his final bow. Clocking in at eighty minutes, the show could've been longer. That's not so much a complaint as an observation that none of the members, including the two sexagenarians, looked fatigued. I just wanted the night to last forever I suppose. I had the best time I've had at a concert all year. It was everything I'd wanted it to be: a once-in-a-lifetime experience for this boy who never thought it would happen. I've seen Soulive a handful of times. I've even seen Eric Krasno solo. But until Saturday night, I'd yet to have seen their sister band Lettuce, despite the fact that "By Any Shmeeans Necessary" is one of my favorite instrumentals ever. Unfortunately, that song didn't make an appearance, but this show was the second in a two-night stand to celebrate their latest release, Crush. It's a fitting title. From the moment the seven-piece funk powerhouse took the PlayStation Theater stage, it was obvious that crushing was what they intended to do. Kicking things off with the aggressive, staccato fanfare of "Evil Wu," Lettuce commanded the room's attention and never let go. 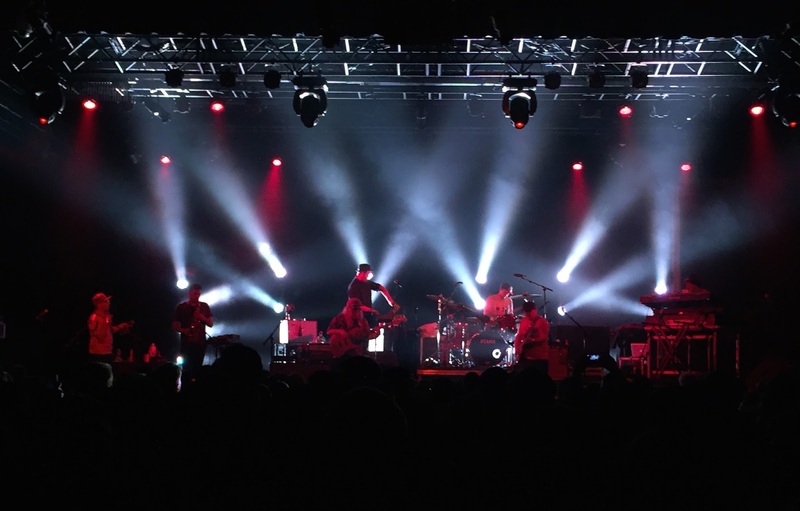 The first half of the set was mostly reserved for newer material, ones of the highlights being "The New Reel," a Neal Evans-penned tune that the keyboardist injected with a fresh batch of spookiness. Krasno rounded out the song by layering in some g-funk Moog lines. The next number was the perfect complement, an as-yet-untitled outtake from the Crush sessions that was decidedly chiller than most of Lettuce's oeuvre. "Pocket Change" presented itself as a soloing vehicle, with both Kraz and saxophonist Ryan Zoidis taking the reins. As the band barreled through "Lettsanity," they welcomed Nigel Hall to the microphone. Hall seemed determined to get the crowd clapping along to James Brown's "Bodyheat," instructing, "If you've got a drink, hold it with your mouth or something." At its completion, Nigel admitted the anxious excitement that he'd felt backstage: "I've been chomping the bit all night. I've been like a Rottweiler on a leash." Surprisingly, Hall didn't perform any tunes from his day-old album Ladies & Gentlemen..., but stuck to material he'd sang on earlier Lettuce LPs, along with forays into "Bustin' Loose" and "Joy & Pain." During "Move on Up," which he dedicated to the victims of the Paris terrorist attacks, Hall moved on upstage to the organ, allowing Neal to have some unabashed fun with a tambourine to wrap up the set. Lettuce returned to the stage with Nigel once more for an encore of "Do It Like You Do." The satisfied audience couldn't help but sing along. Though still in his 30s, Findlay Brown already has a lifetime's worth of stories. From chocolate factory hijinks to being run over by a taxi to watching his girlfriend move countries when he was at his lowest point, Findlay pulls from his experiences to create albums that are not only accessible to the masses, but also time capsules of his life. Brown's latest release, Slow Light, is no exception, inspired by '60s minimal music, relocating to New York City, and his personal revelations at South American shamanic ceremonies. Listen to these tales and more as we drink beers at Troost. Buy Slow Light and We Make Peace on iTunes. Check out his newest Daytrotter session. Open The Next Round Companion Playlist in Spotify or stream it here.